In plants, cell fate is easily reprogrammed even in differentiated cells. 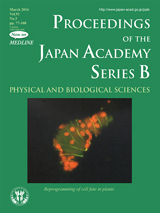 This cover photograph shows an immature tracheary element differentiating from a photosynthetic cell in a xylogenic Zinnia mesophyll cell culture. In the cell, patterned secondary cell walls (yellow bands), which are characteristic of tracheary elements, are being formed, but chloroplasts (orange) and the vacuole (gray) are still retained. 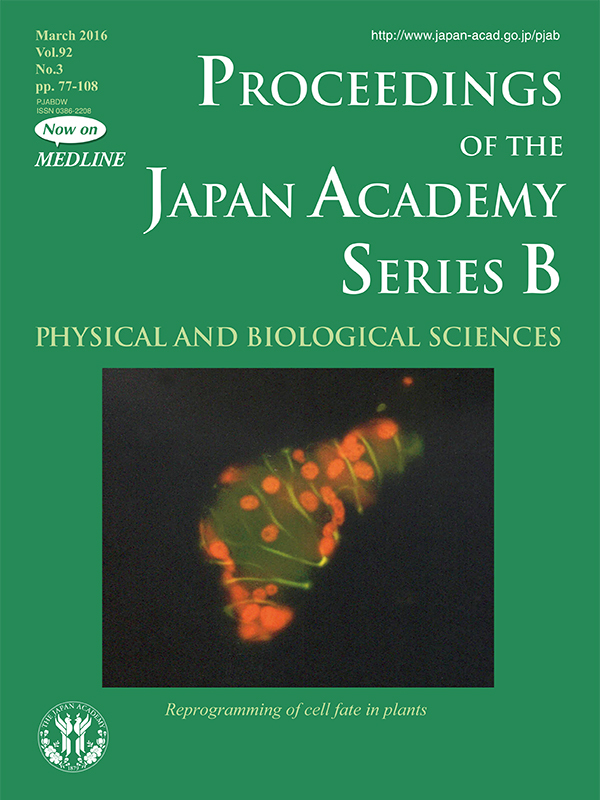 Dr. Fukuda (The author of the paper in this issue, pp. 98-107) has established an excellent xylogenic culture system with plant cells and tissues, which enables to analyze regulation of cell fate in plants, in detail. In xylogenic cultures, mesophyll cells first differentiate into vascular stem cells, which in turn differentiate into tracheary elements without intervening cell division. Fukuda and his colleagues uncovered the molecular mechanism underlying plant xylem development. They identified a 12-amino-acid peptide that functions in maintaining the vascular stem cell state by preventing differentiation into tracheary elements and promoting stem cell proliferation. They named the peptide TDIF (tracheary element differentiation inhibitory factor). TDIF suppresses xylem differentiation from vascular stem cells by activating Glycogen Synthase Kinase 3 proteins (GSK3s), which are major downstream factors to prevent the differentiation. Inhibition of GSK3 activity induces ectopic tracheary element differentiation through induction of its master transcription factors, VND6 and VND7. In differentiating tracheary elements, patterned secondary wall thickenings and programmed cell death proceed to form a hollow water-conducting cell. The pattern is determined by a spontaneous localized activation of small G-protein, ROP11.